One notable change in the industry has come with Carbon Poker closing down their affiliate programme, which is a big concern because poker sites need to be drawing in new players on a regular basis. There is also the fact that cash-outs are taking up to 3 months, or even longer if you are a US resident, and you have to think that Carbon Poker is no longer the big draw that it used to be. It would be fair to say that we think SportsBetting Poker is the more suitable option for Mac poker players. Carbon Poker really is a site that caters for everyone and many people in the world of poker can appreciate the efforts of the site. The site is licensed in Europe now which means that players in the EU can play with great confidence but more importantly, the site is also open to players from the US. This is definitely a huge boon for most poker players. It goes without saying that US based players are delighted to see that Carbon Poker provides a poker option for them but plenty of others players around the world are delighted to learn that they can play against their US friends or test themselves against some of the best players in the world. However, the fact that Carbon Poker also provides a Carbon Poker for Mac option could well be one of the most important factors of the sites popularity. For far too long, online Mac poker players suffered due to a lack of good poker options but this is definitely no longer the case. Being able to join in with the Carbon Poker fun from your Mac is clearly a great boon for many poker players and the site is very proud to display the Apple logo on their site. The fact that Carbon Poker provides software options for Mac is a great starting point for most players but there are other benefits to using this software, including some interesting innovations. There is the “rabbit hunt” option, which informs players which card would have come next and there is the “expose one card” function, which provides an added sense of drama for players. Both of these options are available at cash tables but there is also the “all in percentages” function which details the relative win percentage where there are two or more than two players all in. There is also a great deal of security available on site for players with the SSL 128 bit encryption providing added peace of mind for players. The Merge (also see www.mergepoker.org) network has worked hard to be seen as a site where security comes first, including looking out for illegal and suspicious activities. New players signing for the fun on Carbon Poker will be able to get a 200% matched deposit bonus up to $5000, which is not a bad opening deal. With a $10 minimum deposit on offer, players will earn the value of $1 when they generate 150 VIP points. A bonus is handed out every time a player receives $5 worth of value (750 VIP points) and the bonus is provided in $5 increments. The bonus is valid for a period of 90 days and also entitles the player to a 13% rakeback. 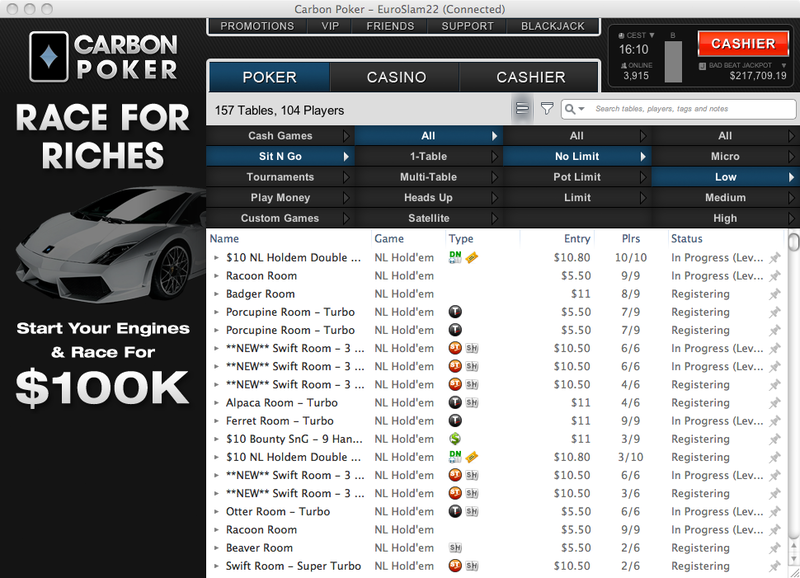 When it comes to banking with the Carbon Poker site, you shouldn’t really have any problems. All of the major credit and debit cards are accepted by the site in addition to a whole host of other options including Neteller, Click2Pay, 1Pay, Moneybookers, EcoCard, Instadebit, ClickandBuy, PaySafeCard and Web Money. When it comes to withdrawing any money you have earned from the Carbon Poker site, the major debit cards, cheque, bank transfer and a selection of e-wallet options have been provided for players. The fact that Carbon Poker is the fastest growing poker site for US players is great news, not just for the American based players who are getting the chance to join in the poker fun but for everyone involved with the site. Mac players know fine well how hard it can be to find a poker site that caters for their needs so the fact that Carbon Poker caters for US players and Mac players indicates that this is a site that is one of the most welcoming! This alone would see it being a popular choice but when it comes to poker sites, the offer of tournaments and promotions is always going to be the most important factor. This is why the fact there is $4.5 million in guaranteed prizes on offer every single month with Carbon Poker is usually enough to get people interested in signing up for the site. When it comes to gaming promotions, there are plenty of things to get excited about when it comes to the site. There are promotions like the Last Man Standing game which provides the drama and tension of slugging it to be the final player in the game or the Royal Flush bonus, where players can boost their bankroll by getting lucky or playing clever. There is also the Tourney King promotion to look out for and this promotion provides a $20,000 prize pool. Poker games are fun but it is usually the offer of cold hard cash up for grabs that will see players make a poker site their home. You also want to keep an eye out for the Sunday Freeroll poker tournament and again, there is a lot of money on offer. Every Sunday the site provides a guaranteed prize of $150,000 so if you are looking to have a poker event to circle on your calendar, every Sunday could be the day for you. There are also bounty and freeroll tournaments to look out for onsite, providing even more opportunities to enjoy online poker in an exciting fashion. Carbon Poker likes to provide as wide a range of poker opportunities as possible and there are many games to enjoy. 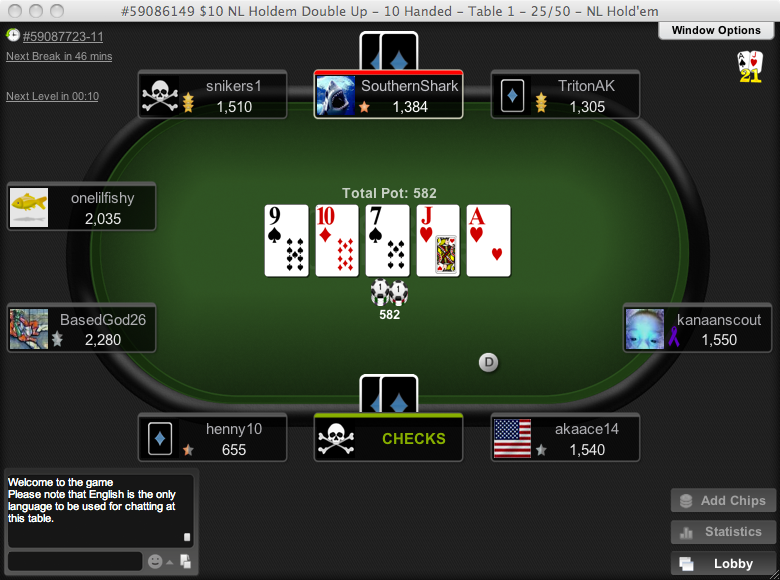 No matter what your preferred poker discipline is, you will likely find it on the Carbon Poker site. The big name games like Texas Hold ‘Em, 5 Card Stud, 7 Card Stud and Omaha are all available but there is even more than this to enjoy on Carbon Poker. You can also enjoy games of Razz, Triple Draw and even Badugi if it takes your fancy so if you are looking for a casino site that gets you playing your favourite poker games, Carbon Poker is the site. Mac players may have felt like a minority in the online poker community in recent times but this is something that female poker players could say as well. Carbon Poker has always looked out for female poker players, providing them with games and tournaments to play in, helping them to have fun or develop their confidence alongside other female players. This provides for a better atmosphere on site and many of the female players are now more than capable of holding their own against the men in the rest of the games. Another huge bonus for Carbon Poker players is the fact that it is possible to win a place at some of the biggest poker events in the world. Satellite events are very important for many poker players and Carbon Poker provides players with the chance to gain entry to WSOP, WPT, Aussie Millions and even the Asia-Pacific Poker Tour. If you want to test your mettle against the best players in the best locations, Carbon Poker can be your passport to a once in a lifetime opportunity. Players are able to get their hands on a 45% daily rakeback deal on the site, which has to be seen as a positive thing for most players. This consistency in getting money back is definitely an added incentive to sign up for the site and it should be seen as a big factor in opting for the Carbon Poker option. The fact that Carbon Poker is viewed as one of the most innovative sites around means that it is no surprise that players are well catered for. The fact that US players are able to join in the fun says a lot as is the fact that Mac players are welcome to play too. These issues alone would be of benefit but the fact that Carbon Poker still manages to provide a great range of tournaments and promotions is great news for online poker players.